Not exactly sure how or why, but many times when I try and preview some URL, I get garbage. 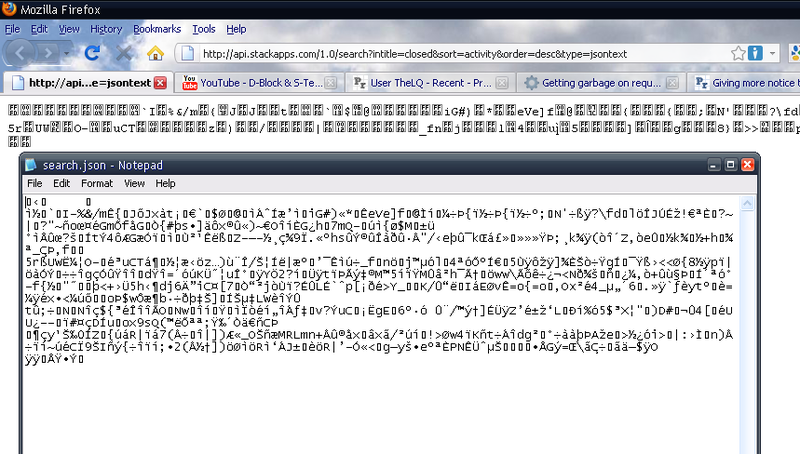 This has happened on several JSON preview websites as well as on my browser. Strangely this isn't all the time. This can also be seen in some of the JSON viewer sites I've used before, either timing out or displaying the same garbage. What on earth could be causing this? I'm really confused here. Sorry about that, I had completely forgot I disabled Gzip compression in Firefox due to a misbehaving site a few months ago. This does explain why some JSON preview apps show garbage instead of actual JSON: They don't handle Gzip compression. Not the answer you're looking for? Browse other questions tagged bug status-norepro json .